For the SS Sicamous Sternwheeler, see Sicamous (sternwheeler). Sicamous is a district municipality in British Columbia located adjacent to the Trans-Canada Highway at the Highway 97A junction, where Mara Lake empties into Shuswap Lake via a short narrows. 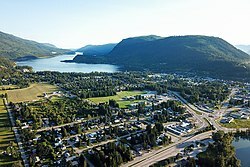 Sicamous is a resort town about halfway between Calgary and Vancouver and is the eastern gateway to the Apple Country. With 341 km (212 mi) of shoreline, it styles itself as the houseboat capital of Canada. It has a population of 3,166. Sicamous is an adaptation of a Shuswap language word meaning "river circling mountains". In the 1800s, Sicamous and area was inhabited by a semi-nomadic Indigenous nation called the Secwepemc or Shuswap. They crossed the Rocky Mountains to hunt buffalo on the plains. In this area they were called the "Schickamoos". In 1871, a Provincial Map shows Schickamoos Narrows, which in early history was known as a "meeting place of Indians". In 1864, gold was discovered on the Columbia River. Seymour Arm became a supply centre in the Big Bend Gold Rush. In 1885, permanent settlers arrived after the driving of the Last Spike at Craigellachie, which linked Canada sea to sea. Among the first settlers in Sicamous were the families from Finland. Old Town, or Eagle Pass Landing as it now known, became an almost instant town in 1871. It was the central supply centre for railway construction. Today it is used primarily for recreational purposes such as sledding, houseboating, hiking, swimming, and biking. Later, in the early 1900s, CPR hill became a residential development. Finlayson's store and a jail were built in 1892, adding a post office in 1904. The first school opened around 1908. In 1949 the bridge was built across the channel, previously having been just a ferry crossing. Several hotels opened. In the early 1900s the Sicamous Hotel was built. The hotel was Tudor style with 75 rooms and a large elegant dining room. The dances were locally popular and well attended. The hotel was burnt down in 1964. Eagle Valley, in Sicamous, became the home of many settlers. They came and farmed the land, putting up with forests, deep snow, and hordes of mosquitoes. The first newspaper in Sicamous was the Eagle Valley News. It was printed for the first time on 22 October 1958; it continues today. Sicamous was incorporated in 1989. In June 2012, the community experienced major flooding due to heavy rains and an abnormally high amount of snow melt from higher elevations nearby. Over 350 residents were evacuated, and many homes were heavily damaged. ^ "Sicamous BC Map, Shuswap Lake Houseboat, Mara Lake, Save Money". Ourbc.com. Retrieved 2014-01-23. 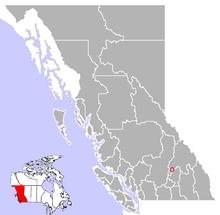 ^ "Sicamous (district municipality)". BC Geographical Names. ^ "Sicamous floods in B.C. wreak havoc on town awaiting influx of summer tourists". National Post. June 26, 2012. Retrieved 23 July 2012.